That Mark Wigglesworth is one of the finest conductors currently before the public is, for too many, a well-kept secret, and he has been recorded rather less frequently than admirers might hope. In this invaluable book, he writes, with immense insight, in often rather beautiful prose, for the general and specialist reader, about the nature of conducting. It is not merely a very clever book, revealing a depth of learning lightly displayed, but a very wise one, whose appeal moves beyond the world of music. Mike Brearley (quoted by Wigglesworth), the former England cricket captain as well as philosopher and psychoanalyst, wrote a superb book, The Art of Captaincy, which demonstrated an understanding of leadership far beyond the cricket field. This book also is filled with insights about human relations. .. we need a reverential humility in the face of works of art that are far more significant than we could ever be, but at the moment of the performance we are part of that work of art and must have a subjective attachment to it if we are to do it justice. Respect keeps its distance. Love gets involved. There is no denying which is more powerful. That sense of humility is pervasive in the book. He notes the ability of orchestras to feel a sense of pride and to rescue the conductor from his errors (I recall very well the last, sad years of Barbirolli, when Hallé concerts were continually saved by the efforts of Martin Milner, the admirable leader). He makes interesting comments on the futility of trying to conduct along with recordings and differentiates the varied skills of conducting opera, orchestral concerts or accompanying a soloist. The book is not a technical treatise about how to conduct: its focus is on the significance and nature of the role. 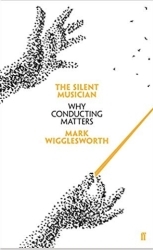 The author does not spend time dissecting the techniques of other conductors, mentioning very few by name. Nor is the work in any sense autobiographical – anyone seeking an account of Wigglesworth’s principled resignation from the ENO will be disappointed. The nearest he comes is a brief statement of the values he believes should be upheld in running an opera company (pp.177-8). It is a long time since I have been quite so enthusiastic about any book on music. At less than £15 in hardback – cheaper as an ebook – it belongs on every music-lover’s shelf, a work both rich and wise.